Explanation: Its core hidden from optical view by a thick lane of dust, the giant elliptical galaxy Centaurus A was among the first objects observed by the orbiting Chandra X-ray Observatory. Astronomers were not disappointed, as Centaurus A's appearance in x-rays makes its classification as an active galaxy easy to appreciate. 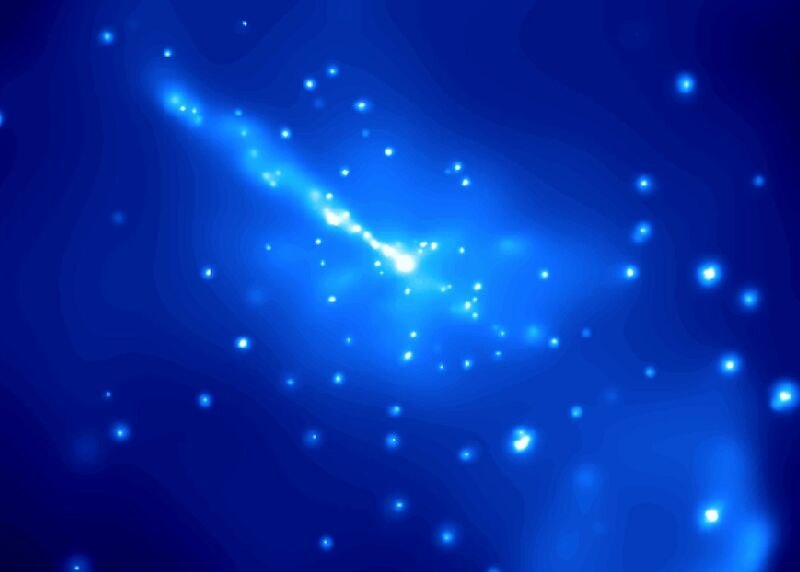 Perhaps the most striking feature of this Chandra false-colour x-ray view is the jet, 30,000 light-years long. Blasting toward the upper left corner of the picture, the jet seems to arise from the galaxy's bright central x-ray source -- suspected of harbouring a black hole with a million or so times the mass of the Sun. Centaurus A is also seen to be teeming with other individual x-ray sources and a pervasive, diffuse x-ray glow. Most of these individual sources are likely to be neutron stars or solar mass black holes accreting material from their less exotic binary companion stars. The diffuse high-energy glow represents gas throughout the galaxy heated to temperatures of millions of degrees C. At 11 million light-years distant in the constellation Centaurus, Centaurus A (NGC 5128) is the closest active galaxy.